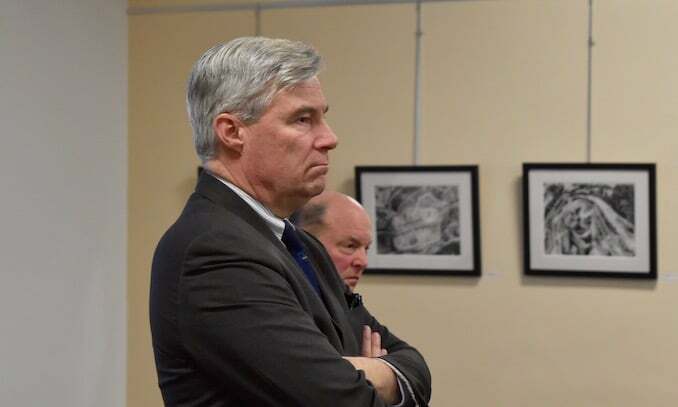 “I’m here today because I have so much respect for your work on climate change,” said Ann Garth, a Junior at Brown University, to Senator Sheldon Whitehouse. “I was a page in the Senate when I was in high school. I watched your Time to Wake Up speech on climate change every week. I remember one time I went to the back of the Senate Coat Room, where they store the posters, because I wanted to touch the poster and feel like I had some sort of physical connection to the history you were making. “Two years ago I interned in your office. I wanted to work in your office because I had so much respect for your passion and commitment on climate change. “As a young person I’m obviously very concerned about climate change. I’m scared for myself and my children and my children’s children. Not to mention all the people who weren’t lucky enough to be born with the privilege that I have who are going to suffer even more from climate change. “The recent IPCC report indicates that we really don’t have any more time to waste. We need to take immediate action and not just immediate action but bold action. We need to stop emitting carbon, we need to stop building fossil fuel infrastructure, especially in places where people already suffer from massive amounts of environmental racism. “We need to be creating renewable energy that’s going to create jobs for Americans that are sustainable and meaningful for them. Which is why I’ve been excited to see the Green New Deal resolution that Senator [Edward] Markey [Democrat, Massachusetts] just introduced in the Senate because it will solve these problems. It will stop climate change. 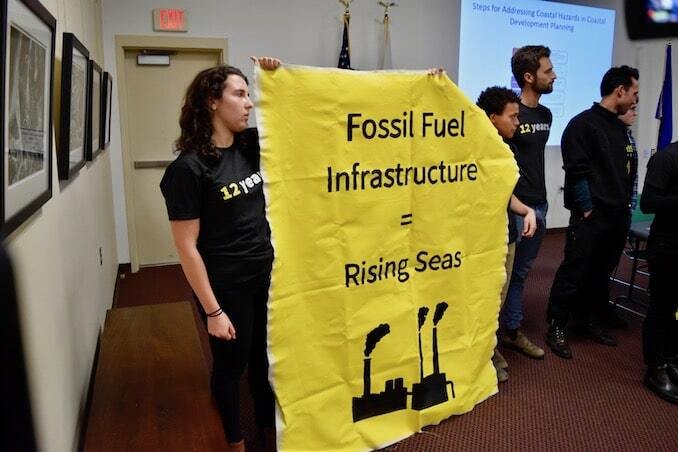 It will protect our communities from rising seas and from dirty fossil fuel infrastructure. It will create green, livable jobs. “You have talked in emails and on Twitter about how important the Green New Deal is and about how we need to stand up against the fossil fuel money that is polluting our discourse and is fueling the opposition to real action on climate,” continued Garth. “You’ve spoken about how important it is to really be bold and have a Green New Deal. “This is really confusing to me because you have not yet co-sponsored the Green New Deal resolution and your work has been so influential on this and you have demonstrated so much passion for this. You’ve talked for so many years about how we need to act to stop climate change. Just over fifty people were in the community room at Cranston’s Central Library to hear Rhode Island Senator Sheldon Whitehouse (Democrat, Rhode Island) and Grover Fugate, executive director of the Coastal Resources Management Council (CRMC) speaking on the topic of “Preparing Rhode Island Communities for Rising Seas.” Garth asked her question during the Q and A. 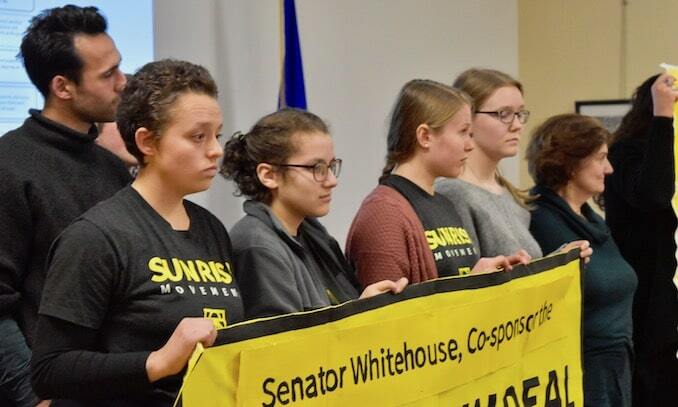 In response to Whitehouse’s answer, about 20 people, members of Sunrise RI and supporters, rose, unfurled large banners, and took over the front of the room. “We have a stunt prepared,” quipped Whitehouse. Whitehouse continued to take questions from the audience. A woman rose and told the young people from Sunrise RI how much admiration and sympathy she had for them. Nicole DiPaolo, a member of Sunrise RI, invited those in the room “who stand with our generation and taking bold action for climate change” to come join them in the front of the room. Now over half the room was standing with Sunrise RI. The woman admitted that she didn’t know much about the Green New Deal, and asked for an explanation. She also asked for an explanation from Whitehouse as to why he won’t support it. “You have a team,” said Mary Pendergast from the Sisters of Mercy. “People would get on board if you did,” said Lauren Manus from Sunrise RI. “I don’t see that,” said Whitehouse. After Whitehouse explained his position, Sunrise RI walked out, taking about 40 percent of the room with them. Many of those who chose to stay were not sold on Whitehouse’s position however. In fact, many didn’t even understand Whitehouse’s position. Whitehouse explained that Senate President Mitch McConnell (Republican, Kentucky) is attempting to force a vote on the Green New Deal to divide the Democrats. He called the move “disgraceful.” Whitehouse didn’t answer the second part of the question, so the woman repeated it. It was difficult to follow Whitehouse’s logic. Afterwards I asked Whitehouse if he would vote against the Green New Deal if McConnell forced a vote.